Last week, Samsung told us to expect the introduction soon of an evolved, enhanced version of its Exynos 5 Octa-core processor. 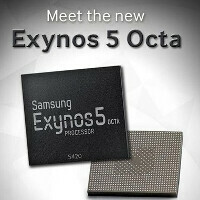 Sure enough, on Monday the latest Exynos 5 Octa-core chip was unveiled. The new Samsung Exynos 5420 will include a six-core ARM Mali-T628 GPU that handles 3D graphics twice as fast as the previous Exynos 5 Octa-core. 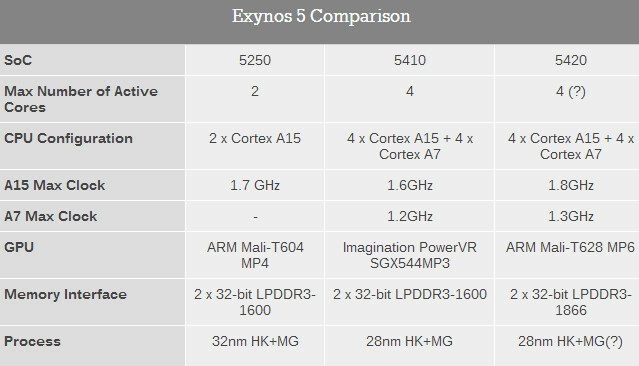 It is a return to the ARM based Mali GPU following the use of a PowerVR chip in the Exynos 5420 (see the chart below). Turning to the CPU, the eight cores are made up of four ARM Cortex-A15 processors clocked at 1.8GHz with four additional Cortex-A7 cores at 1.3 GHz. With the big.LITTLE set-up, only one set of four cores is active at a time. CPU processing capabilities are improved by 20% over the predecessor chip. Total system power is lowered when multimedia content is brought from memory to display panel thanks to the multiple image compression (MIC) IP block on the chip. This maximizes the battery life of a device with a high-resolution display, even those with a resolution as high as 2500 x 1600 (WQXGA). Battery life is conserved even when browsing or using multimedia rich apps, or other applications that require the screen to be frequently refreshed. The new Samsung Exynos 5420 is being sampled by customers and will be mass produced starting next month. There is speculation that the international version of the Samsung Galaxy Note III will feature this silicon under the hood. SEOUL, Korea, July 23, 2013 – Samsung Electronics Co., Ltd., a world leader in advanced semiconductor solutions, today introduced the latest addition to the Exynos product family with top level of graphic performance driven by a six-core ARM® Mali™-T628 GPU processor for the first time in the industry. With mobile use case scenarios becoming increasingly complex, Samsung's newest eight-core application processor gives designers a powerful, energy efficient tool to build multifaceted user interface capabilities directly into the system architecture. Samsung will demonstrate the new Exynos 5 family at SIGGRAPH 2013 in the ARM booth, #357; Exhibit Hall C at the Anaheim Convention Center. Samsung's new Exynos 5 Octa (product code : Exynos 5420), based on ARM Mali™-T628 MP6 cores, boosts 3D graphic processing capabilities that are over two times greater than the Exynos 5 Octa predecessor. The newest member of the Exynos family is able to perform General-Purpose computing on Graphics Processing Units (GPGPU) accelerating complex and computationally intensive algorithms or operations, traditionally processed by the CPU. This product also supports OpenGL® ES 3.0 and Full Profile Open CL 1.1, which enables the horsepower needed in multi-layer rendering of high-end, complex gaming scenarios, post-processing and sharing of photos and video, as well as general high-function multi-tasking operations. "ARM welcomes the latest addition to the successful Exynos Octa 5 series, which uses ARM's Mali GPU solution to dramatically improve graphics performance," said Pete Hutton, executive vice president & general manager, Media Processing Division, ARM. "ARM big.LITTLE™ and ARM Artisan® Physical IP technologies continue to be at the heart of the Octa series and now complement the new functionality brought by ARM GPU Compute. This combination enables unprecedented capabilities in areas such as facial detection and gesture control, and brings desktop-quality editing of images and video to mobile devices." "Demand for richer graphic experiences is growing rapidly nowadays," said Taehoon Kim, vice president of System LSI marketing, Samsung Electronics. "In order to meet that demand from both OEMs and end users, we developed this processor which enables superb graphical performance without compromising power consumption." The newest Exynos processor is powered by four ARM Cortex®-A15™ processors at 1.8GHz with four additional Cortex-A7™ cores at 1.3 GHz in a big.LITTLE processing implementation. This improves the CPU processing capability by 20 percent over the predecessor by optimizing the power-saving design. In addition, the multiple image compression (MIC) IP block inside this System-on-Chip successfully lowers the total system power when bringing pictures or multimedia from memory to display panel. This feature results in maximizing the usage hours of mobile devices with a high-resolution display such as WQXGA (2500x1600), in particular when browsing the web or doing multimedia application requiring the frequent screen refresh. What Battery efficiency? Go and read Tech2's comment below. Yes, surely better than 5410. When I knew about the Imagination's GPU SGX544Mp3 inside the Octa 5410, I doubted that how could it works with CCI-400 (a very important part of big.LITTLE architechture) because it can only work with a ARM's GPU. And the fact showed after that 5410 does not have CCI-400, and that's why there is no "pair" of a Cortex A15 and Cortex A7 as many said before Now, this one is an ARM's GPU, and I'm sure that Samsung includes CCI-400 into it. The battery efficiency is much better. That would mean that the S4 is already running on old specs. 20% more power, twice the graphic abilities; 40% more battery consumption, twice the heat production. Samsung missed out another 2 features. Dog headed with a grudge against Samsung. Don't waste your life away hating.. I give credits to any company when due, but i have not been impressed with what Samsung has been doing. Their Exynos processor-powered phones has a lot of issues, and even with countless "improved" ones the problems are still there, not to mention the one in the S4 still lack proper LTE support. Exactly. They are the first to open the article and reply and show the world pathetic they sound. Such people think they have better understanding of the chip by reading an article than the entire engineering team who spend months working on them. @EXkurogane, Do you realize its not the battery consuming PowerVRSGX544M3 from the GS4 ? Also, its only overclocked by 0.2 Ghz how would that increase the heat consumption to twice ?....smh TBH, I wasn't expecting much, just some usual updates but I was really taken aback by the twice the GPU. Already GS4 had one the most powerful GPU (if not the most power efficient). Its like the best of SD800 (processing) & Tegra 4 (GPU) put together. Awesome ! I was being partially sarcastic. But im indeed concerned with the GPU boost because that does produce more heat. My country has both S600 and Exynos versions of Galaxy S4 available, consumers get to choose, and you wont believe how many dumb consumers went for Exynos and sacrificed LTE thinking they could get DOUBLE processing power seeing Exynos has 8 cores when it is not exactly the case. It is indeed a bit faster than snapdragon 600, but far from double, just a slight bit faster - and only in benchmarks. The GPU in GS4 was from 2010 and it was well documented that it is a battery drainer but Mali have a proven track record of power efficient GPU. It was developed later in 2012. OMG, if Exynos Octa 5410 was a bit faster than sd600 in your own words then if Samsung says it will be twice better in GPU department than of course it will even beat out Adreno 330 in SD800 no doubt that too without draining that much of battery with Mali GPU ! S4 Exynos also has LTE support! S800 doesn't have the best processor. Cortex A15 is a much faster than Krait. Tegra 4 has the best processor along with the best GPU. S800 excels in Perf/watt. That's why we are seeing S800 on 5" slim phones like Galaxy S4. But we won't see Exynos 5420 or Tegra 4 in phones anytime soon. You mean the exact Quadcore Cortex A15 @ 1.8GHz (and could never fit into a phone) is some how "better" ? And a GPU without Unified Shader let alone Open GL ES 3.0 is "the best" ? All things considered, S800 has a better/futureproof GPU. Cortex A15 is faster but a battery drainer thats why they failed to gain traction until the big.LITTLE architecture. Tegra 4 runs on A15s all the time so you can expect the battery life on that thing. Plus the 72 core GPU will not be helpful in anyway to conserve the battery as well. Samsung released the GS4 with Exynos Octa 5410 after 3 months of uneviling the processor. Why do you think they won't do the same with Note 3 ? They can very much land in the devices within 3-4 months. Nah, 20% more power isn't always translated into more battery consumption. Perhaps samsung change the CPU architecture & fix the design failure so that with the same amount of silicon, it can produce more power but keep the battery consumption at the same level. You won't say that stupid thing if you follow the progress of CPU & GPU in computer... Remember how Nvidia GeForce GTX 480 is replaced by GeForce GTX 580? GTX 580 has almost the same amount of transistor as GTX480, has the same silicon technology (40 nm), but GTX 580 has better power consumption & more processing power. I hope this has a working Cache Interconnect. Otherwise this too will be a failure. Yeah, right! When you're not satisfied with the original battery and use third party cheap battery. well damn...Qualcomm, you may need to start thinking about getting a Snapdragon 810 out soon. Wish companies were racing for better and advance battery just the same way they compete for screen and processor. But they are. That's what the new Krait, Haswell or big.LITTLE architecture is all about. you are talking processor. im talking battery. someone needs to take first step, leave Lithium-ion alone move to another element, something that holds charge for longer, charges faster. that sort of thing. and dont say that im dreaming because Engineering universities keep making newer battery every year that is best prototype of its time so why not bring it in commercial use? Why not buy a powerful laptop instead of this phone ?